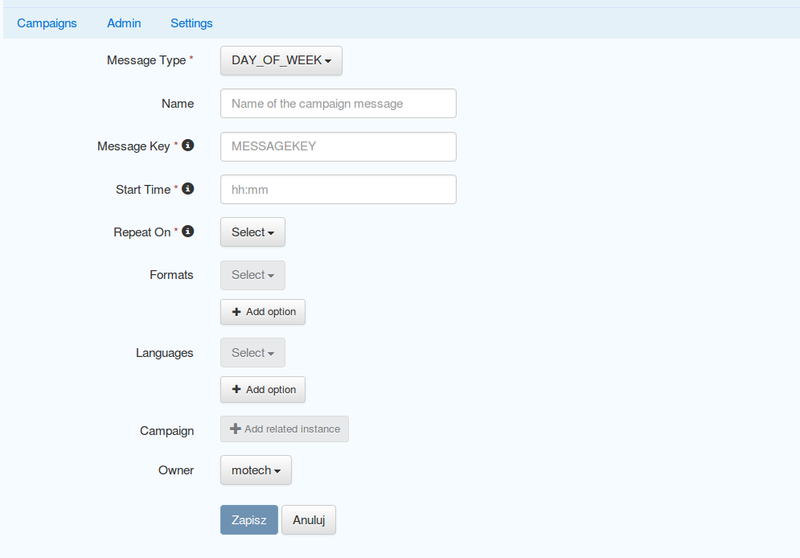 The MOTECH Message Campaign module is used to enroll users into messaging campaigns. A user may be a patient, worker, lab, facility, or other desired recipient of the information to be disseminated. A campaign is a course of informational messages that are sent to the target user on an assigned date or schedule. A user can be entered into a campaign at any point during its duration via a Campaign Request. Users may be removed or re-enrolled into campaigns. The languages and formats of the campaign messages can be specified (IVR, SMS, English, etc). However when a campaign message fires, the handling of that event, including the actual messaging of the end user(IVR, SMS, etc.) is left to the implementation. Campaign messages follow a clearly defined schedule and are automatically triggered by the scheduling system. Each campaign has a type, which is determined by an enumeration called CampaignType. The CampaignType determines the type of message that will apply to the campaign. In a particular campaign, all campaign messages must be of the same campaign type. 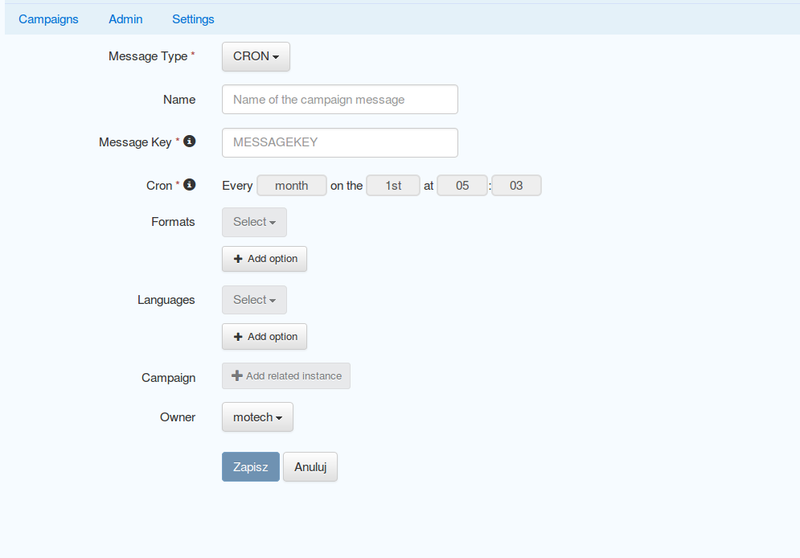 The module contains five different campaign types: absolute, offset, repeat interval, day of week, and cron. All campaigns contain a field for the campaign name and a list of campaign messages. Each type of campaign has additional fields that correspond to its type specification. 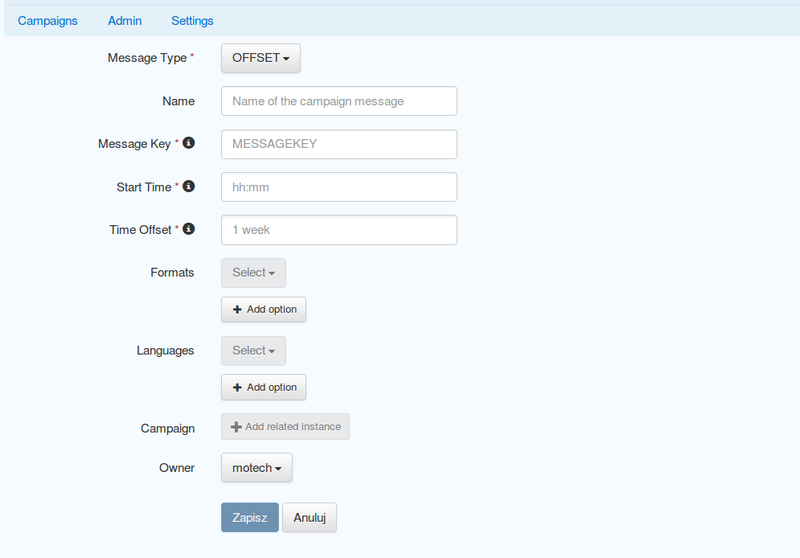 Each campaign message has the fields name, formats, languages, messageKey, and startTime, along with additional fields depending on its CampaignType. messages An array of messages of the campaign. startTime The time at which the message will be sent. In this type of campaign all messages have absolute, predefined delivery dates and times. 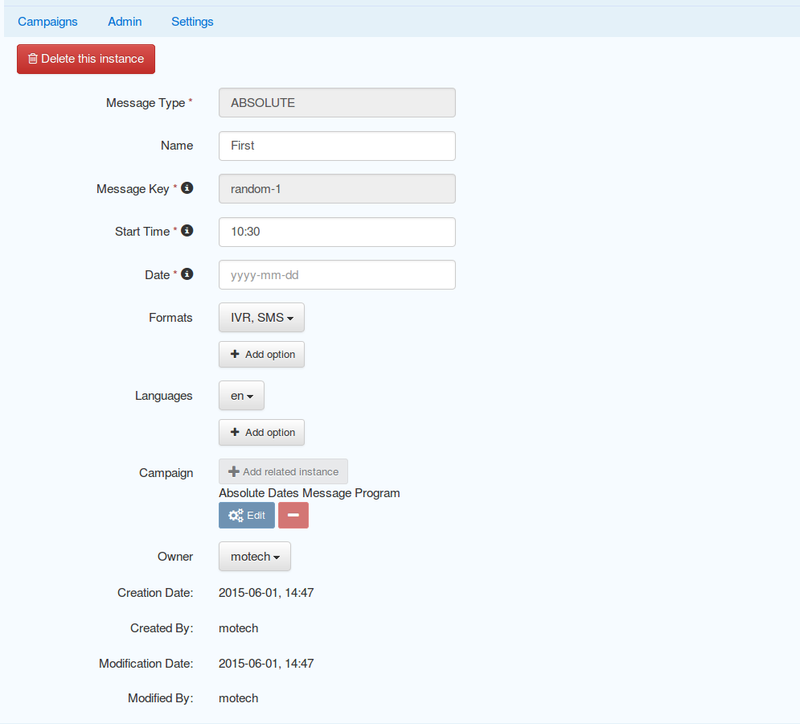 Absolute campaign messages contain the additional field: date, which indicates the date that they will be sent on at the time specified by the startTime. In this type of campaign all messages have delivery dates and times with defined delay. Offset campaigns include an additional field: maxDuration, which is optional. This field specifies the maximum duration of the campaign. Offset campaign messages contain the additional field timeOffset, which defines the amount of time from the reference date or current date that will elapse before the message is sent. If no reference date is supplied, then the message campaign scheduler uses the current date as the reference date. OFFSET campaigns allow clients to enroll into the sequence of messages at any point within the sequence. In this type of campaign all messages repeat periodically based on their interval value. Repeat interval campaigns include an additional field: maxDuration, which is optional and specifies the maximum duration in which the messages will be repeated. Repeating campaign messages contain the following additional message field: repeatEvery. The repeat interval combined with the maximum duration determines how many messages will be scheduled at the time specified by the startTime. In this type of campaign all messages fire on the days of week(Monday, Tuesday, etc.) specified. Each day of week campaign message contains an additional field: maxDuration, which specifies the maximum duration of the campaign. Day of week campaign messages contain the additional field: repeatOn, which specifies which days of the week the message will be sent on. 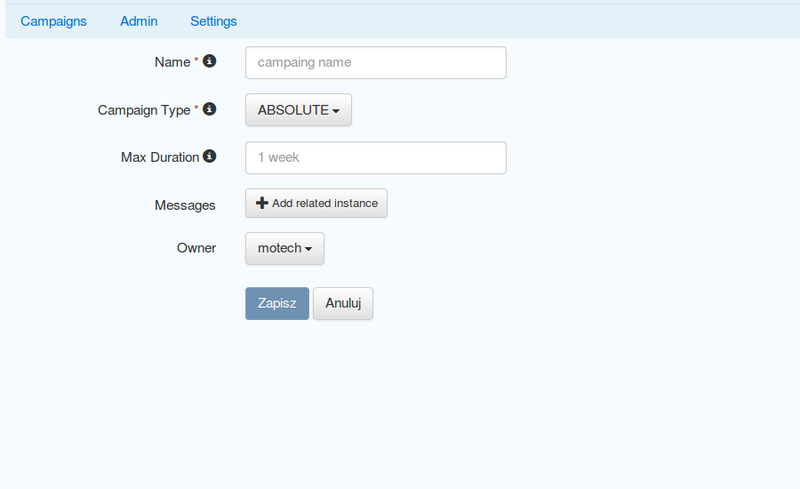 You can create Campaigns and Messages through Admin tab. When you’re creating Message you need choose the message type, depending on chosen type appropriate fields will be enabled. You can add Messages to the Campaign only if they are the same type as the Campaign. You can upload JSON files entering the Settings tab. You can copy a file to the message-campaign directory. The name of the file has to be message-campaigns.json. Message campaign records will be created after MOTECH started. 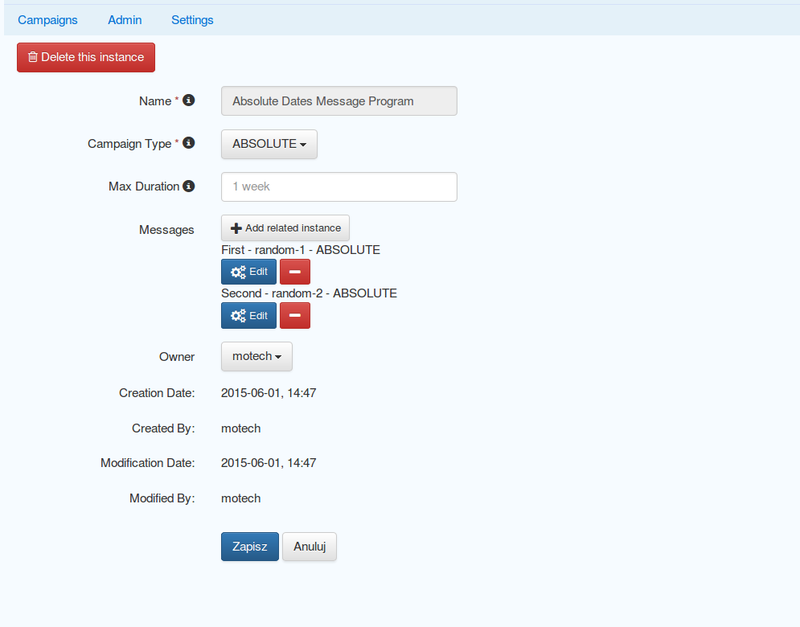 Campaigns and Messages can be edited through UI. When you’re editing campaign you cannot change campaign name. After saving changes to the campaign all scheduled jobs will be removed and new appropriate jobs will be created. When you remove campaign all enrollments and messages belonging to that campaign will be removed as well. When you’re editing message you cannot change message type and key. After saving changes to the message all jobs scheduled for that message will be removed and new appropriate jobs will be created. When you remove message all jobs scheduled for that message will be removed. Go to the Campaigns tab, choose a message campaign and add an enrollee. A campaign request associates a user (worker, patient, lab, etc.) with a unique campaign name, start time, and reference date. The campaign name determines which campaign will be retrieved or unscheduled from the JSON document. The reference date determines the calendar date that the campaign will begin for that user. If no reference date is supplied, then the current date upon enrollment is used in its place. The start time specifies what time of day in hours and minutes that the message will be sent. CampaignRequest has following fields. referenceDate LocalDate The date the campaign has started for this enrollment. It can be in the past resulting in a delayed enrollment. startTime Time Time of the day at which the alert must be raised. This overrides the campaign’s deliverTime. * against it according to the campaign definition. * Update existing campaign enrollment with data specified in the request. * Unenrolls all campaigns which match criteria provided by a CampaignEnrollmentsQuery object. Below is an example of a JSON document that includes two campaigns, each with a number of campaign messages. Each campaign object has three fields: name, type and an array of messages. The REPEAT_INTERVAL campaign has an additional maxDuration field. Each message contains fields determined by its type. Campaign requests associate the user with these campaigns. A reference to the campaign’s name, such as “Absolute Dates Message Program” must be included in the CampaignRequest. This allows the system to schedule jobs for the user based on the associated campaign. In the below example, if a user is enrolled in “Absolute Dates Message Program”, two separate jobs (messages) will be scheduled. In the “Relative Parameterized Dates Message Program”, twelve jobs will be scheduled for the user. The number of repeating messages is determined by the repeat intervals compared with the maximum duration. In the example below, Repeating Message #1 would have five scheduled messages due to a maximum duration of five weeks and repeat intervals of 1 week. Repeating Message #2 would have four scheduled messages due to a maximum duration of five weeks and repeat intervals of nine days. The org.motechproject.messagecampaign.service.MessageCampaignService interface, in addition to its capability to enroll/unenroll all message(s), is capable of searching Campaign Enrollment Records based on particular criteria provided by a Campaign Enrollments Query object. This service’s search() allows the client to query for enrollment records using various criteria: external ID, status, and/or campaign name. Queries are built by adding one or more of these criteria to the Campaign Enrollment Query’s list of criteria. The clauses together define specific search criteria. The method returns a list of matching Campaign Enrollment Records. will find active enrollments enrolled into “My Program” campaign. Message Campaign module fires following events. org.motechproject.server.messagecampaign.unenrolled-user Fired, when a user is unenrolled from a campaign.